Here are my reactions to Episode 405 of the OUTLANDER TV series, titled "Savages". I thought this was an excellent episode, one of the best so far this season. The opening shot shows a shopkeeper wrapping up the little doll to sell to a customer, presumably Herr Mueller. "I have a daughter....but she lives far, far away." "She is here," Adawehi says. "Yes," Claire says, and puts a hand over her heart. And now we get our first good look at the finished cabin. I like the look of it very much! From the outside, it's very much like the image I've had in my mind for years. And speaking of first glimpses, here's the infamous White Sow <g>, about to make a meal out of Jamie's hat. I like the details of the interior of the cabin, though I don't think they would have had those fancy diamond-paned glass windows. As Claire goes about packing for her visit to the Muellers, notice that Jamie takes one of the silver candlesticks and puts it in his bag, careful to be sure she didn't see him do it. Jamie's dream about Brianna's birthmark comes straight from the book, and I'm very glad they included it here. "I dreamt of Brianna, now and again." "Really?" That was a little startling; I too had dreamt of Brianna in our icy shelter--something I seldom did. "I did wonder..." Jamie hesitated for a moment. "Has she a birthmark, Sassenach? And if so, did ye tell me of it?" "She does," I said slowly, thinking. "I don't think I ever told you about it, though; it isn't visible most of the time, so it's been years since I noticed it, myself. It's a--"
His hand tightening on my shoulder stopped me. "It's a wee brown mark, shaped like a diamond," he said. "Just behind her left ear. Isn't it?" "Yes, it is." It was warm and cozy in bed, but a small coolness on the back of my neck made me shiver suddenly. "Did you see that in your dream?" "I kissed her there," he said softly. Meanwhile, back in 1971, Roger has come to Inverness in search of Brianna. He tracks her to Mrs. Baird's B&B (where Frank and Claire stayed in Episode 101, "Sassenach"), which is apparently now being run by her daughter. The younger Ms. Baird gives Roger a letter from Bree, saying, "She asked me to wait a year before sending it to ye." So Bree goes off without a word, and all she leaves behind is this one letter, clearly intending Roger to find it only if she doesn't come back? That seems much harsher than it was in the book, more emotionally devastating for Roger. Jamie and Young Ian have come to the town to try to recruit settlers. Jamie gives Ian a stack of flyers describing the offer of land on Fraser's Ridge, and goes off to find the silversmith, a man named MacNeil. The silversmith's wife seems to be openly flirting with Jamie, though he doesn't react. Back on Fraser's Ridge, Claire is at the Muellers' cabin, having just delivered Petronella's baby. The Mueller's cabin is smaller and not as fancy as Jamie and Claire's. "We say she looks like her papa, may he rest in peace." This is a change from the book, and it's a sobering thought, a young mother with a small baby, left without a husband to provide for her. Meanwhile, in Woolam's Creek, Jamie is trying to recruit men to settle on the Ridge, offering 100 acres of land apiece, but not having any luck. Faced with necessity, Abel had left his wife in their cabin, and gone posthaste to Salem. But by the time he returned, six shillings in hand, his property had been seized and sold--to [the sheriff's] father-in-law--and his cabin was inhabited by strangers, his wife gone. And that in fact was where he found her, wrapped in a threadbare quilt and shivering under the big spruce tree on the hill that sheltered the graves of the four MacLennan children, all dead in their first year of life. Back at the Muellers' cabin, Petronella announces that they've named the baby Klara. Claire seems flattered and a little taken aback by the news. Herr Mueller gives Petronella the little doll that we saw in the beginning of this episode as a gift for the baby. Suddenly Rollo starts barking, alerting them to the arrival of "savages", a group of Cherokee seeking water from the nearby creek. Herr Mueller is furious, and grabs a musket, saying, "They have no reason to set foot on MY land!" And just like that, the situation escalates into a potentially deadly confrontation, with both sides pointing weapons at one another, and Claire standing between them, trying to defuse the situation before someone gets hurt or killed. "Water belongs to no one," the Cherokee leader says. "You're right," Claire replies, "but he doesn't see it that way." A small band of Indians had stopped at the Mueller farm asking for food and drink. Mueller, with whose opinions of Indians I was thoroughly well acquainted, had driven them off with considerable abuse. The Indians, offended, had made--said Mueller--mysterious signs toward his house as they left. Claire arrives home at last and collapses on her bed in exhaustion and relief. The next day, she settles back into the routine of farm chores: feeding the livestock ("You've no idea you're just a Christmas pork chop, do you?" she tells the White Sow), cooking, and so on. After dark, puttering around the cabin by candlelight, you can see her looking up at the shelf above the hearth where the candlesticks are kept, noticing the missing one, but she doesn't comment on it. The day after that, more shots of livestock-feeding (which does sort of beg the question, who was feeding them when Jamie and Ian were away and Claire was at the Muellers' cabin? ), including a pair of goats. Claire spends the day quietly, doing chores, tasting a bit of Jamie's homemade whisky (at least that's what I think was in the bottle), and generally staying out of trouble. Meanwhile in Woolam's Creek, Jamie's still not having any luck attracting tenants. When Ian asks what will happen if they can't find settlers for the land, Jamie doesn't seem concerned. "The tax collectors will come to me, will they no? 'Tis my land, after all." I liked the note of pride in Jamie's voice as he says that. Just then Ian discovers the horse has a broken bit. "We'll need to get it mended before we can travel." This seems like an incredibly obvious thing to say, intended only to explain the situation to the 21st-century audience, and I didn't care for it. It's sort of the equivalent of someone today saying, "Uh-oh, the car has a flat tire. We'll need to get it repaired before we can travel." Yeah, no kidding! As soon as Murtagh spoke, I felt a little shiver of recognition, just at the sound of his voice. I was one of those book-readers who didn't like the fact that Murtagh survived Culloden in the first place, but I will grudgingly admit that it's good to see him here. And it's fitting that Young Ian is the one who first encounters him, because Murtagh and Ian have never laid eyes on one another before. Murtagh looks older than when we last saw him (understandable, as this would be about a dozen years later). He's a contemporary of Jamie's parents, so I would estimate his age as somewhere in his mid-seventies. He looks to be in far better health than when we last saw him at Ardsmuir, though. Twenty-one shillings?! That sounds like a small fortune by the standards of the colonies. It's awfully convenient that Young Ian just happens to be carrying a small purse with plenty of coins in it. Jamie, meanwhile, goes back to the silversmith's shop, where he's met by MacNeil's wife again. I'm not really sure what the purpose of this pair of scenes is, except as a way to show us that Jamie is happily married and therefore not tempted by any beautiful women he happens to encounter in town. I love the look on Jamie's face as Young Ian confesses that he gave the blacksmith all that money. I liked the reunion scene very much. It's very well done, from the first moment when Jamie storms into the blacksmith's shop, full of righteous indignation. Murtagh just stands there at first, frozen with shock at the sound of Jamie's voice. And then Murtagh turns around. At first Jamie's face is an expressionless mask (to hide strong emotion, just as in the books?) but then he smiles, and they embrace. "Who you calling an old coot, eh?" Murtagh says to Ian, and the expression on his face made me laugh. Back on the Ridge, Claire is doing her chores (again!) when she hears Pastor Gottfried pounding on the cabin door. He announces that Petronella, her baby, and the boy, Tommy, are all dead of the measles. "[Herr Mueller] blames you for their deaths." That's a change from the book, where Mueller's rage was focused solely on the Indians. But it makes sense here, because of the way Claire behaved in the earlier scene: "Herr Mueller believes you let the Indians curse their water." Uh-oh! In the next scene, we see Claire loading a rifle. She doesn't look like #SuperClaire to me there, just a pioneer woman doing whatever she has to do to defend her home, in the absence of her husband. Meanwhile, in a tavern in Woolam's Creek, Murtagh fills them in on what he's been doing in the past twelve years. So he was indentured to a blacksmith, and when the man died, his wife sold the business to Murtagh. It seems awfully convenient that Murtagh should turn out to have the skills of a silversmith as well. "I can manage a bit," he says. But I liked his reaction when he realized the candlestick had belonged to Jamie's mother, Ellen, whom he had loved as a young man. The bit of byplay between Ian and Murtagh over the bag of coins made me giggle. And I loved Murtagh's reaction when Jamie said, "Claire...she came back to me." "Come to Fraser's Ridge. We'll work together, as we always did." Murtagh hesitates -- he seems tempted -- but declines the offer. The scene shifts briefly back to Fraser's Ridge. Claire is alone in the cabin at night, armed with her rifle, with only Rollo for company. Both she and the dog seem a little jumpy, with Rollo barking at a noise that turns out to be only the wind. Murtagh's whole demeanor in the meeting with the other men reminds me strongly of Dougal in Episode 105, "Rent", when he was making speeches in taverns to rouse the villagers and crofters in support of the Stuarts. "The time is coming when we will march!" I'm surprised to see this -- aside from his brief stint as a "drill sergeant" in Episode 209 ("Je Suis Prest"), Murtagh never struck me as a leader of men in the way Jamie is, let alone the sort who stood up in front of a crowd and made impassioned speeches -- but then again, we don't know the details of what he's been through in the last few years. He's changed a great deal, just as Jamie and Claire changed in their years apart. So Murtagh is a Regulator. And of course, those of us who've read the books know exactly what's coming, in less than three years: the Battle of Alamance. "I canna in good conscience involve myself in this," Jamie says, and that's the end of it, as far as he's concerned. But it seems clear that this conflict between them isn't going to end any time soon. I think that's a good thing. Conflict makes for good storytelling, and it should be interesting to see where this leads, not just in Season 4, but beyond. Back on the Ridge, Gerhard Mueller is pounding on the cabin door. Claire points her rifle at the door, only to see Mueller walk right in. Why on earth didn't she bolt the door like a sensible person?!? I like the way Claire's voice shakes as she says, "Thank you for your concern, but I'm well." Mueller hands her a package, wrapped in the same cloth that he used to wrap the doll, only it contains the fresh scalp of the Cherokee woman, Adawehi. Even though I knew this was coming, I shuddered at the sight of it. I liked Claire's reaction very much. I also liked the contrast between his out-of-control shouting and Claire's calm, steady voice as she says firmly, "Goodbye, Herr Mueller." And the way Claire cries at the end. Cait did an excellent job in this scene! 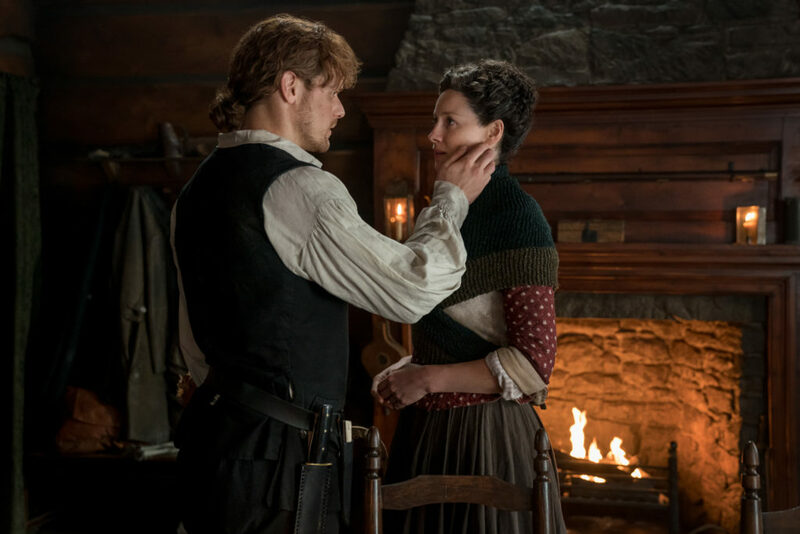 The next scene shows Claire, grieving, making a little bundle of Adawehi's things and packing them up in a box, then carefully placing the box on the fire. It's a touching gesture, but I didn't like the fact that she wasted a useful wooden box like that. The scene with the Cherokee shooting flaming arrows at the Muellers' cabin took me totally by surprise. It's a vivid and very dramatic scene, riveting to watch, but I'm just thankful that a stray arrow didn't ignite a forest fire by accident! Herr Mueller's wife stumbles out of the cabin in her nightdress, and is immediately hit by one of the flaming arrows. She falls, Mueller runs toward her, and he is cut down in turn. I understand why they did this, as it makes for a very dramatic end to this story arc. Still, I can't help observing that Gerhard Mueller did not actually die in the books. Later, Claire is out collecting firewood when she hears someone whistling a very familiar tune -- "Boogie Woogie Bugle Boy". It's Murtagh, of course, come to stay on Fraser's Ridge. I loved the choice of music there, because that particular tune is, of course, a reminder of their time looking for Jamie together in Episode 114, "The Search". Suddenly we shift forward in time 200 years, and the sun is rising over Craigh na Dun. Roger is reading Brianna's letter. "I found out something terrible is going to happen to my mother and Jamie. If I didn't try to go and help them, I would never have forgiven myself." And if Roger doesn't go after her, he'll never forgive himself. I like the 18th-century costume Bree is wearing, and I liked the way the camera swung around to show the empty space in front of the stone where she'd been a moment before. Excellent episode! I can't wait for next week! I hope you enjoyed this recap. Look here for my recaps of all of the OUTLANDER episodes so far, and please come back next week to see my recap of Episode 406. How does Jamie know the Scot’s name is also Brian? (Minor point.) Jamie was talking to one of his recruits, not the bartender. I think the six farmers at the table would have all been introduced beforehand ... and this is just a follow up on Jamie’s part to figure out why they are so disinterested in his land. I really enjoyed this episode, my favorite so far this season. I was happy about Murtaugh’s return and his reaction to Jamie telling him Claire came back to him was priceless. I also love their cozy cabin, I pictured it more bare and basic in the book. Also a huge shout out to the awesome Ian, he is one of my favorites and they cast a perfect Ian. I wanted to make a comment about Brianna's dress. I was in my teens in the late sixties and what she was wearing in the show was something that was very popular at the time: a granny dress. This style was a pseudo-antique style of dress. I had a couple myself. The cut of the bodice, the trim of the dress, the way the ruffles were done at the bottom and the fact that it was short enough to show her ankles ALL look like a granny dress; NOTHING like the period dresses of the rest of the show that look historically authentic. Claire went through much work in the book and the movie, to make sure that her dress was as close as possible to the specific period she was going to. And in the book, Brianna actually wore men's clothing to go back. I realize that this is fiction, but anyone going to the 18th century would know that all women's dresses showed NO ankle. It's just my opinion, but I think the show was just showing that she was trying to hurry to get back and grabbing a granny dress would have been faster than going to the work of creating something much more authentic. I'm remembering that Brianna had chosen a 17th century costume that was not what a "lady" would wear, but maybe I'm just extrapolating. I also remember those "granny" dresses of the late 60s and early 70s, so it doesn't seem out of place for Brianna at the time. I don't remember the men's clothing from the books. I did think I would see Brianna wonder about the buzzing sounds the rock had that made Claire turn towards it in the first place, when she first went through the stones. I was delighted to see the cabin but WOW, it certainly seemed very posh--the leaded windows, the full finished mantle. I'm not saying they couldn't have finished the cabin with most of the items, but the fancy window glass would seem to be above their means. All in all, a good episode. And I am glad about the reappearance of Murtagh. Hi Karen loved this episode and loved seeing the cabin , its the way I pictured it and love the reunion between Murtagh and Jamie , was glad to see Young Ian meet him first and his reaction to him calling Murtagh Old Coot and liked seeing Falkland again and Mrs. Baird's Inn again am lking Roger more and more and hope to see more of him . seeing Murtagh being among Regulators will be trouble which Jmaie needs to avoid which he tells Murtagh this , Herr , Mueller , deserved what he brought on hi self by commiting cold blooded murder sorry to say , they did him no harm but he was out of his mind giving Claire the remains of her friend so he get the revenge he deserved , loved seeing Murtagh return to Fraser's Ridge for good Brianna is her father's daughter by leaving Roger the letter and going through the stones without telling him , but he will follow her . will be looking forward to the next one which will feature Lord Joh Grey a favorite of mine , season 4 is getting better and better , will be watching more soon. Happy Holidays . Loving Outlander. When the Scots-Irish began coming in droves to Pennsylvania in the 1730s - 1770s, before heading down into the back-country of Pennsylvania, Virginia and North Carolina, the women's dresses shocked the Quakers, with their nipped in waists and shortened skirts. These were hard-working women and a shorter skirt was practical. I've done a lot of research while doing a family tree, and I don't think Brianna's attire would scandalize any rural Scots at that point in time. I did think having two fireplaces in such a small cabin was a waste of wood - but it's lovely. And thank you, Karen, for surprising me again. I failed to notice it was the same B&B in Inverness where the story began. Karen, Reading your view of Outlander's episodes makes the series more enjoyable. The review last week was your best ever. You have an eye for details that I miss and it is fun to see them when I watch it the second time. Why did you think that Murtagh was coming to Fraser's Ridge to stay? I thought it was just to visit. This week's review was a good one, too. Thank you for sharing. It was great to see Murtagh again. I couldn't help but squeal with happiness a little. I don't remember Mueller from the book (it was so long ago that I read it) or the reaction of the Indians, but he brought it on himself when he killed Adawehi. Jamie and Claire's cabin is about the size I imagined, but much nicer. I expected something a little rougher, less perfect. I had the same thought you did when Claire burned the box. "Why would you burn such a nice box?" Seems like something like that would be very useful, but I guess she figured Adawehi was worth the sacrifice. When Brianna went through the stones, I had chills and clapped my hands a little. I can't wait to see her at Lallybroch and can't wait for her to meet Jamie and see her mom again and meet Young Ian (who is my favorite character in the books), and then Roger going back, too. I'm so excited! Great review again, as always. I always enjoy your feedback after watching an episode! 405 will go down as one of my many favorite episodes. I loved the range of Jamie's emotions after young Ian tells him his purse is spent, after a very unsuccessful attempt at finding settlers, to his realisation that he was seeing Murtagh for the first time in so many years. You can feel how deeply the loss of Muragh after Ardsmuir prison affected him. I particularly liked the awe in Jaime's voice when he tells Murtagh that Claire had come back to him and Murtagh's reaction was pure gold! Young Ian is a gem by the way! Claire's scenes were equally riveting. I really enjoyed seeing her perform the every day chores, it really brings home the fact that they have indeed created a home together at long last. Murtagh whistling the tune only they would know and their reunion was truly touching! I am very excited to see Bree and Roger's story develop!